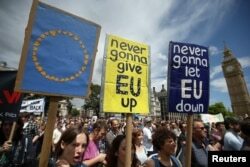 People hold banners during a 'March for Europe' demonstration against Britain's decision to leave the European Union, in central London, Britain, July 2, 2016. Several experienced British litigators along with the country’s leading public-interest law firm are drafting a legal challenge to the Brexit referendum to force -- at the very least -- a parliamentary debate before the government triggers the automatic procedure for exiting the European Union. The legal action may add to the political and financial tempest provoked by the June 23 referendum, turning the turmoil into a perfect storm. The group consisting of eight lawyers drawn from several different legal firms, including Bindmans, which specializes in human rights law, wants to test Brexit in the courts. The lawyers expect their action will get passed up quickly to the country’s Supreme Court, with a ruling likely by September, if their action proceeds. At the heart of the legal challenge to the government invoking Article 50, which automatically triggers a two-year exit mechanism, will be the question whether the prime minister has the legal power to implement Brexit without a full parliamentary debate and vote by Britain’s lawmakers. The overwhelming majority of lawmakers -- 454 MPs to 147 -- are opposed to Brexit – as are a majority of Peers in the House of Lords. The Peers can delay legislation. The Conservative government only has a narrow overall eight-seat majority in the House of Commons and most Tory lawmakers are also pro-Remain. “There is a constitutional question whether the result of the referendum having been advisory should advise Parliament, which is democratically enfranchised, or a prime minister, who never is democratically enfranchised as he or she are not directly elected,” says Maugham. Protestors hold banners in Parliament Square during a 'March for Europe' demonstration against Britain's decision to leave the European Union, central London, Britain, July 2, 2016. Maugham says the seed funding for the action has come from an online crowd-funding appeal. Contributions were capped at $140 and the group raised $15,000 in a few hours. “We didn’t want to appear to be funded by some rich people. 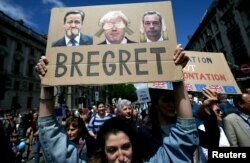 And we certainly didn’t want this to appear as a bunch of overpaid lawyers drinking at the trough,” he says. The group will return for more funding as their legal action unfolds. All of this will form part of the case Maugham and his colleagues likely will present to the judges. They are not the only top lawyers exploring a range of legal options, including whether the government was right to deny a vote to British expats who have been overseas for more than 15 years. 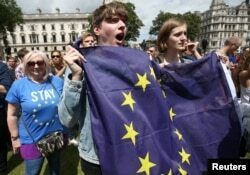 People hold flags during a 'March for Europe' demonstration against Britain's decision to leave the European Union, in central London, Britain, July 2, 2016. On Monday a major London firm, Mishcon de Reya, said it was preparing also to challenge when and how the British government invokes Article 50. The firm has declined to reveal the identity of its clients. But it has retained two of the country’s leading advocates – one of them, Lord Pannick, has argued dozens of cases before the UK’s Law Lords and the European Court of Justice. Needed or not, some lawyers are exploring the legal opinion of Philip Allott, Professor Emeritus of International Public Law at Cambridge University. He argues the government’s motivation for calling the referendum could be challenged. Speaking to VOA, Prof. Allott says it could be argued the referendum was not in the national interest but prompted by a rebellion within Conservative ranks. He said also the government “failed in its duty to take into account the possible damaging impact on groups of people” nor did it seek ahead of time to minimize injury.